Dunedin International Airport is one of the five largest and most important airports in New Zealand. 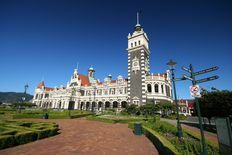 Regular scheduled flights serve Christchurch, Wellington, Auckland, Brisbane, Sydney or Melbourne. The airport is located near the communities Allanton and Mamona on Highway # 1 / # 87, about 27 km or 20 miles south west of Dunedin.